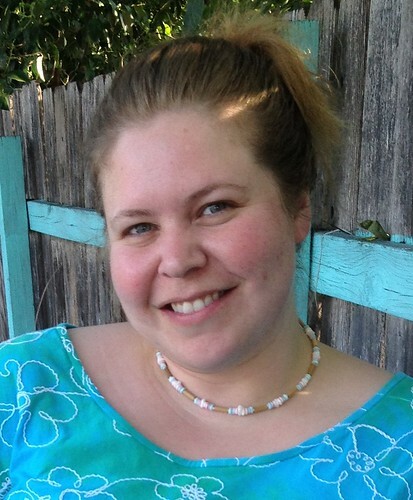 I should have known that I was heading into tricky waters due to the mixed reviews for Butterick 5356 on PatternReview.com. I have learned many a trick, tip, and pattern error/correction from the reviews there, but I try not to assume that others’ experiences — good or bad — will be mine. And although I have a finished object here, my jury is still out on the pattern. I have an extensive crafting fabric / quilting cotton stash, with variety in every color. It makes it fun to pick prints that complement each other — for say, a tote bag — because there are so many options. It’s rare for me not to be able to find a combo I like. I have a humongous apparel fabric stash too, but by the time I narrowed down the type of fabric I was looking for in the appropriate colors, I didn’t have as much to choose from. Combining prints is tricky business, and I am the most successful when I have a bunch of choices. 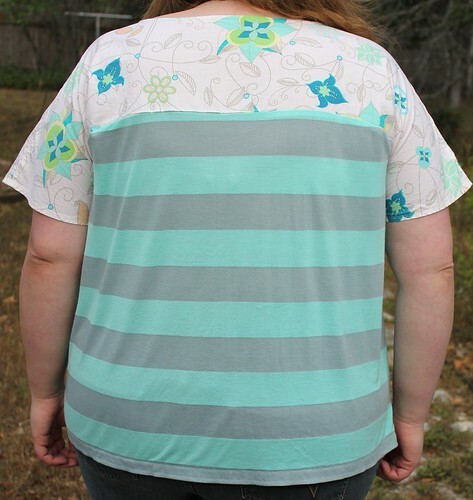 The aqua and gray striped jersey is a blend of cotton and rayon, if I remember correctly. It is lightweight, oh-so-soft, and has great stretch and recovery, but it isn’t as shifty as an all-rayon jersey. By the time I realized I loved this fabric — which, incidentally, was when I saw this top of Dixie’s — The Common Thread was almost out of it. I was able to get the last piece, which was less than a yard after prewashing. Perfect for the “skirt” pieces of this top. Since I usually buy way more of any fabric than I need, it was kind of a great feeling to have no leftovers this time! I definitely think this pattern requires something drapey like this for the lower part, because it’s shapeless otherwise. A note about sizing and fit. I have tried many pattern alteration and grading techniques over the past couple of years. Over time, I will write much more on that topic, as I think it could be helpful to others. For now, I’ll just describe what I’ve found works best for me with the Big 4 top/blouse patterns. (For any who are unfamiliar with this term, Big 4 refers to Butterick, McCall’s, Simplicity, & Vogue.) I typically cut a size 22 based on my high bust measurement. 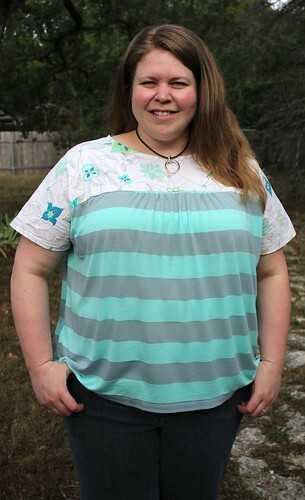 That almost always fits great in the neckline, shoulders, and armscye, which are all crucial for a well-fitting top. I then do a full bust adjustment (FBA) if necessary, which it usually is. The amount of my FBA depends on the design, but it can be up to 5″ total. Next, since I am clearly shaped like a fall-fruit-which-shall-remain-nameless, I grade out at the hips unless there is copious design ease. The other change I often need to make is to widen the sleeve pattern at the upper arm. Of course, all of these alterations are not needed on a loose-fitting top like this, but a quick measurement of the bicep area told me I’d need a little more room there with a woven fabric. Instead of deciphering how that modification would work with this pattern, I just decided to cut an XXL (24-26). That would also ensure enough room at the hips, since I didn’t want the shirt to be snug there with this light and drapey knit. I could always take it in if it looked too loose in other areas, but I doubted that would be necessary with this design. And since there were no set-in sleeves, I didn’t think being too large in the shoulders would be that much of an issue. I was wrong. I had only been considering the fabric above the shoulders, not below. In fact, I now think that the cut-on sleeves make it more important for the shoulders to fit correctly. See the below pic — the side bust area, and corresponding yoke above it, come out too far on me. The bulk there feels weird. Also, the wider yoke makes the sleeves look and feel too long. I don’t think this will keep me from wearing it, but it definitely could fit better. I absolutely love the top and it loks good on you. Might give it a try. Looking forward to seeing your changes. I love when people share their grading experiences! i like the top. would look cute with lace on top too! I love your fabric combination- this pattern seems so similiar to Simplicity 2147, one of my favorites! Nicely done.